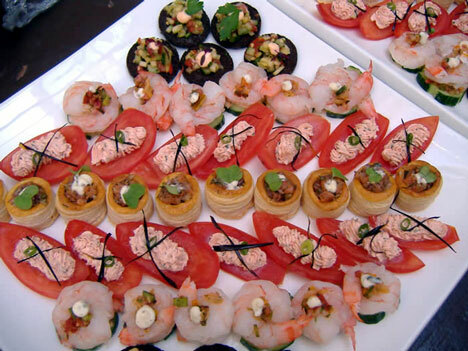 bride.ca | Wedding Catering: Buffet or Sit-Down Dinner? "Whatever way you choose to serve your wedding food, work with your caterer to design the right menu for you. Keep your budget in mind and select dishes that not only offer beautiful presentation but will also be liked by most guests".. When planning your wedding reception, you have an incredible number of decisions to make including music, decorations and of course, food. Before planning your exact menu, you should consider how the meal will be served. Do you prefer a sit-down dinner, a buffet, or something else entirely? Here we look at the benefits, as well as the disadvantages, to each option. With a sit-down dinner reception, your guests sit at assigned tables and the meal is served to them by the waitstaff. 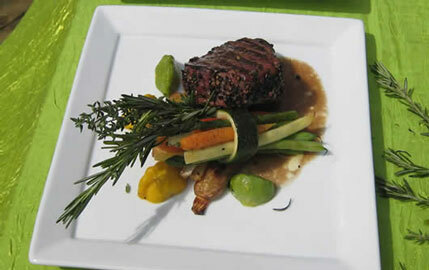 Dinners are normally plated on individual plates and then served to each guest. This is considered more formal than the other kinds of services. The advantage of this type of reception is that your guest don't have to wait in line for their food and you have a lot more control over the timing of the other activities at the reception. Oftentimes plated sit-down dinners are expensive, but it depends on what type of food you are serving. One disadvantage of a sit-down dinner for your guests is that it limits the number of choices they have to eat. Normally only two entree options are offered in a sit-down dinner. Similar to a sit-down dinner, guests are assigned to tables and waiters bring the food. 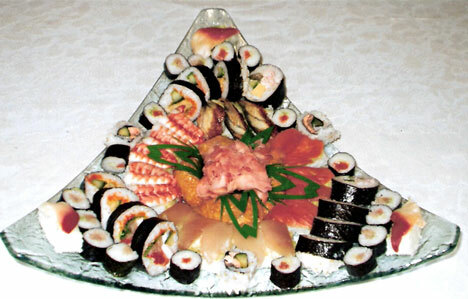 However, this time large platters of food are placed on the center of the table. Guests can pass around the platters and choose which items and how much food they would like. The waitstaff will clear away the platters as they are emptied. Though family style is normally considered a little more casual than a traditional sit-down dinner, you can keep it formal if you'd like with elegant china and glassware, along with waiters in tuxedos serving top quality, sophisticated foods. With a buffet, a long table (or two) is set up with the courses in order. Guests take a plate and serve themselves. Buffets are sometimes cheaper than sit-down dinners because they cut down on the waitstaff needed. However, if you offer your guests a wide array of options on the buffet, including seafood and other pricey items, the costs can actually exceed a sit-down dinner. The disadvantage of this type of meal is that the lines can get long, making the dinner portion of the reception last much longer than you'd like. 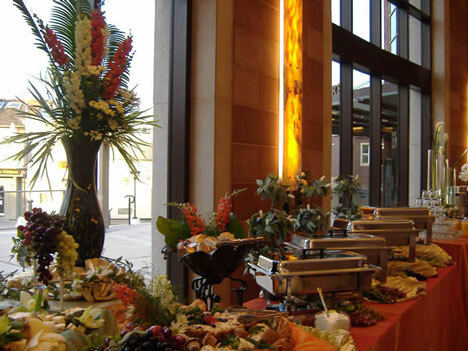 Food stations are similar to buffet dinners, except different tables of food are set up throughout the wedding reception facility, rather than having one long table in a line. This allows your guests to get the food they would like much more quickly. 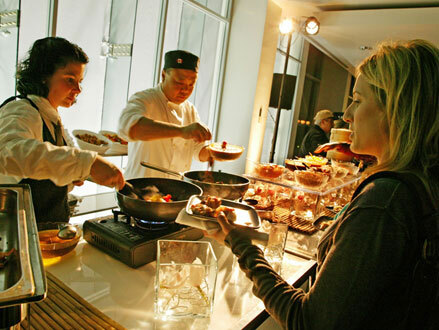 Food stations are often interactive, including carving stations, omlette stations and even ice cream sundae stations. Learn how these stations can simplify your catering and treat your guests by reading our previous article about food stations. In recent years, many couples are choosing a living room style reception, rather than a formal meal. These wedding receptions are often held in a night club or lounge rather than a bright, large reception hall. Comfortable couches, chaise lounges and overstuffed chairs are set up around the venue where guests can relax, mingle and drink cocktails. You can offer a bar for guests to order drinks or have waiters come around and take orders. Oftentimes hors d'oeuvres on silver trays are also brought around to guests. This type of reception is usually reserved for evening weddings and can be less expensive than the other options because you aren't serving a full meal. Whatever way you choose to serve your wedding food, work with your caterer to design the right menu for you. Keep your budget in mind and select dishes that not only offer beautiful presentation but will also be liked by most guests. There's no reason to spend money on elaborate, exotic foods if no one will eat them. If you are looking to reduce costs, eliminate the seafood from your menu, cut down on the number of appetizers or serve only house liquor. Communicate with your caterer and/or wedding planner to find out how to get the most for your money, while also throwing a beautiful wedding reception that your guests will remember for years to come.